The IPKO brand belongs to the telecommunications company Telekom Slovenije. The operator has good GSM coverage, on par with the local market leader Vala. The number of IPKO clients makes up about 37% of the total number of mobile subscribers in Kosovo. If you choose a profitable package of services, you will be able to successfully run a traffic termination business in the country and make good money on it. IDEAL PACKAGE. Cost - $5.7. Unlimited within IPKO network, unlimited SMS, 300 minutes for calls to other networks. TIP PACKAGES. This range includes 4 packages: TIP STANDART (100 minutes + 100 SMS, cost — $2.8), TIP TRENDY (100 minutes + 200 SMS, cost — $4.5), TIP AKTIV (150 minutes + 200 SMS, cost — $5.5), TIP NDRYSHE (150 minutes + 200 SMS, cost — $8). The packages also differ in the amount of mobile Internet traffic. PLAN PACKAGES. The most suitable packages for termination from this range are: PLAN 1 (Unlimited within IPKO network + 700 for calls to other networks, cost — $11.4), PLAN 2 (Unlimited within IPKO network + 1000 for calls to other networks, cost — $17), PLAN 3 (Unlimited within IPKO network + 1200 for calls to other networks, cost — $22.8). For efficient performance of your equipment — gsm gateway antrax or another VoIP gateway, choose IDEAL PACKAGE from IPKO. 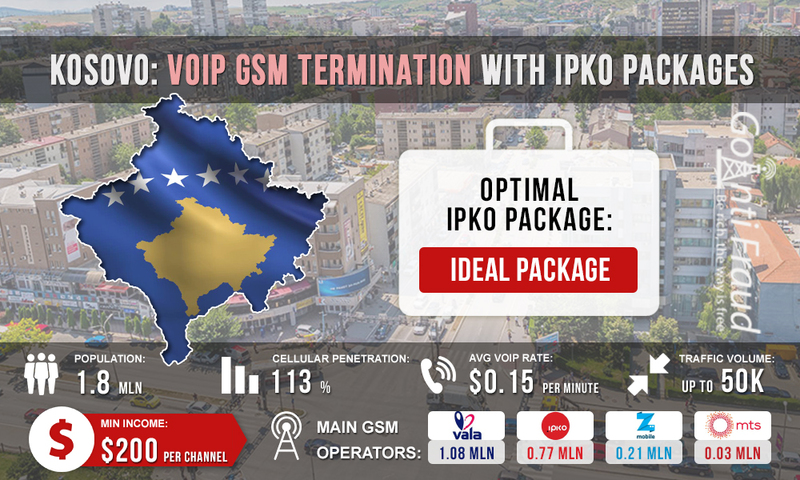 With this package, a minute call will cost you $ 0.01, which will allow earning a minimum of $ 700, if you accommodate your VoIP equipment in Kosovo.